But on to the main event! I've gone into full-fledged pumpkin mode around here, making whatever baked goods I can with that bright orange puree. 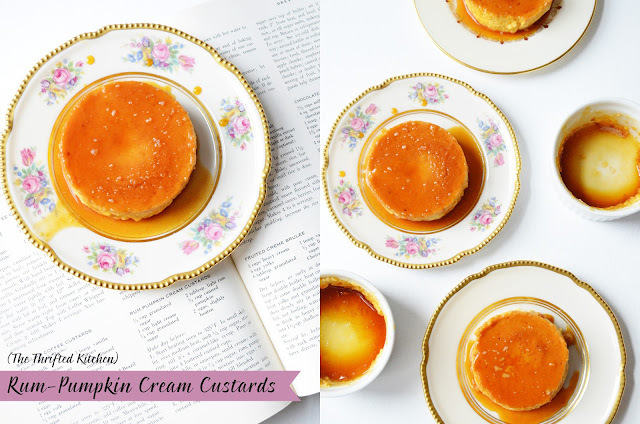 This recipe was my first of the season, and comes from the 1963 edition of the Good Housekeeping Cookbook, specifically the "Dreamy Desserts" section. 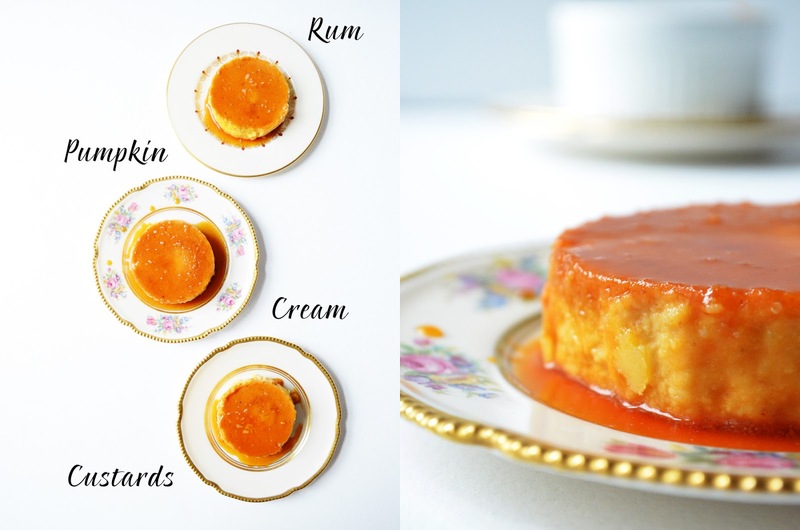 It's a really simple dish to whip up, especially for those of you looking for an elegant fall dessert for your Halloween party, and the flavors blend together pretty seamlessly, creating a light creamy custard with just a hint of pumpkin. 1) When you butter the custard cups, make sure it's an even layer that's not too thick. I don't know if you can see it, but mine have little chunks of butter on the tops that taste fine, but might look a little weird. 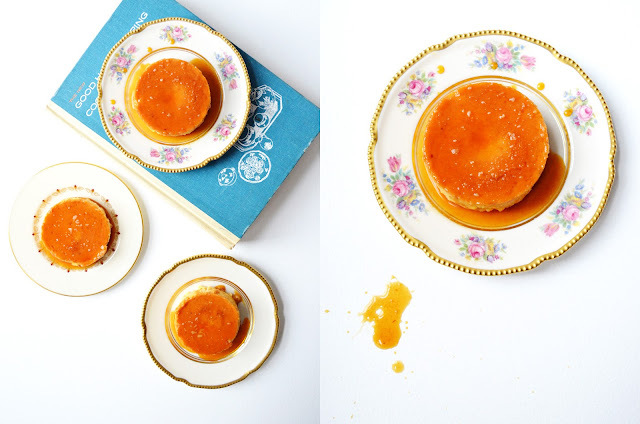 2) Keep in mind that when you pour the caramelized sugar into the ramekins, it will harden almost on contact, so move the saucepan in a sort of circular motion as you pour the sugar to make sure you evenly coat the bottom. 3) To scald cream, put it into the saucepan over medium-high heat and stir until cream just starts to form bubbles along the edge, then turn the heat off immediately. 4) When tempering the eggs, after you've mixed some of the saucepan mixture into it, pour it all back into the saucepan slowly (as in drizzle it in), whisking constantly. It may seem like overkill, but I always do this to add an extra preventive measure against curdled eggs, which makes for gross custards. 1. Start heating oven to 325 degrees. In small skillet, over medium heat, melt 1/3 cup sugar, stirring, till it's a caramel-like syrup. Pour at once into four buttered custard cups. 2. Meanwhile, in saucepan, scald cream; with hand beater, beat in 1/4 cup sugar, rum, pumpkin. Beat some of this mixture into eggs; return all to saucepan; beat till blended. 3. Then slowly pour pumpkin mixture into custard cups; set in shallow baking pan, and place on oven rack. Fill pan with hot water to within 3/4" of top of cups. 4. Bake about 45 minutes. Near end of baking time, insert silver knife in center of one custard. When knife comes out clean, remove custards; cool; refrigerate. 1. Removed custards from refrigerator; let stand 15 minutes. 2. Run spatula all around inside of each cup; invert on individual dessert plate If desired, pass rum at table to spoon over custards.